There are 21 players remaining, and the current chip leader appears to be Andrew Weinstock with 90,000. WEinstock is no stranger to Foxwoods poker. 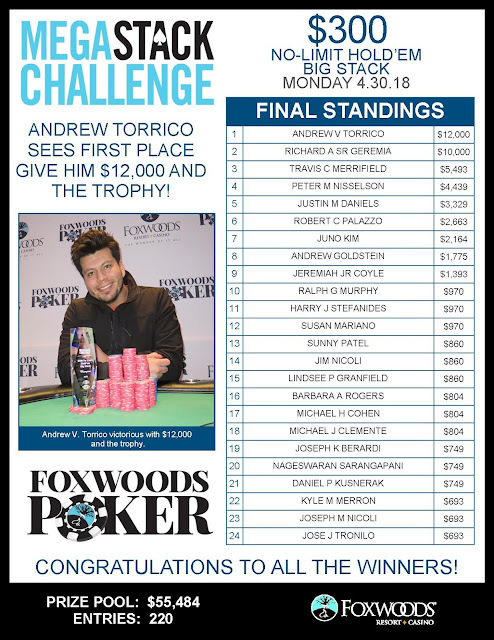 He won his first trophy here in October of 2017 after taking down the $300 Pot-Limit Omaha High Event for just under $4,000 + the trophy. There were a total of 56 entries in the second flight of the $400 No-Limit Hold'em Multi-Flight Event #6. Play will continue through Level 15. At the conclusion of Level 15, the remaining players will bag up their chips for the night, and will return to play Day 2 on Friday May 4th at 11 am. Here is a look at the 14 players advancing to Day 2 from Flight A of the $6400 No-Limit Hold'em Multi Flight Re-Entry event. These 14 will join any players that bag in Flights B, C, and D, and will return to play Day 2 at 11:00 am on Friday May 4th. Hany Wasseff bagged the chip lead of Flight A in the last few minutes of the night when he picked up pocket aces against former chip leader Roger Laflamme's ace-king. Laflamme was knocked out a few hands later, in a double elimination at the hands of Attilio Bitando. The very last hand of the night, Roger Laflamme moves all in from early position for 8,500. Attilio Bitondo calls on the button, and Fernando Zambrano moves all in over the top for around 70,000 from the big blind. Bortando thinks for a second or two before calling. The flop comes 8♠4♠3♥, leaving Zambrano in the lead with his pair of jacks. "No ace," Zambrano says just before the turn comes the A♠. "Oh man, come on," Zambrano says right before he calls for a jack, but it's the K♦ that arrives on the river, awarding Bitondo the pot, and eliminating Zambrano and Laflamme from play the very last hand of the flight. In the last ten minutes of the night, Hany Wassef doubled through Roger Laflamme A♠A♥ against Laflamme's A♦K♥. The board ran out 10♠8♥8♣5♥J♦, awarding Wassef a huge double up, propelling him to the chip lead of Flight A.
David Mock moves all in for 31,000, and it folds around to Fernando Zambrano in the big blind. "I call," Zambrano says as he turns over 6♠6♣. Mock shows A♣2♥. The board runs out 7♣3♠2♣K♠10♥ awarding Zambrano the pot, and eliminating Mock from play. Mock has the option to enter into the second Flight B, across the room, should he choose. Players are now heading into their final 15-minute break of the day. They will return to play Level 13, with 800/1,600 blinds. 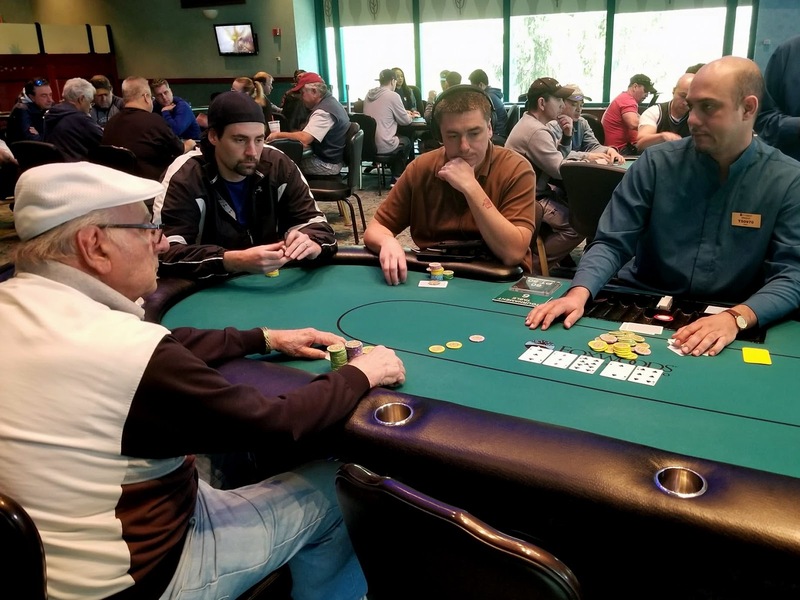 Play will resume for three full levels, and any player remaining at the end of Level 15 will bag up their chips, and will return to play Day 2 on Friday May 4th at 11am. A list of notable chip counts will be posted upon return from the break.